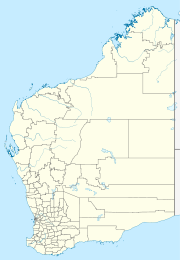 Yandanooka is a small town in the Mid West region of Western Australia. The town is located between Mingenew and Three Springs on the Midlands Road. The name of the town is Aboriginal in origin and is the name of the local water source and is thought to mean "plenty of hilly country in sight". The townsite was gazetted in 1919. The first settler in the area was Thomas Whitfield in the 1850s and was a railway siding on the original route of the Midland Railway when opened in 1895. The siding was then moved 4 km to the South and land around the siding was set aside for a townsite. Lots were surveyed in 1913 then gazetted six years later. In 1927 the town was suffering from a lack of accommodation and the locals presented a petition to the licensing board in Mingenew to open a hotel in town. Railway traffic had increased dramatically, in 1922 only 13,000 bags of wheat were sent by rail. This increased to 80,000 in 1925 and was expected to be over 100,000 in 1927. In 1978 the Primary school closed with children having to travel by bus to Mingenew and teenagers to the High school in Morawa. The transportable room was relocated to Eneabba and the original school building was demolished in the 2000s. The Principals house was transferred into private ownership in 1979 and is only remaining school site structure still standing. In 1979 the general store also closed, the nearest shops now being 20 km away in Mingenew. In the 1980s the siding closed to grain receivals, farmers now trucked grains into Mingenew and the grain facilities removed. Another dwelling was added to the blocks behind the former general store. By 2010 all that remain of the town site are the former general store now a private residence. The town hall with adjoining CWA kids park, a small shed used by locals for mail receivals, the Principals house. ^ Australian Bureau of Statistics (25 October 2007). "Yandanooka (State Suburb)". 2006 Census QuickStats. Retrieved 7 March 2011. ^ Western Australian Land Information Authority. "History of country town names – Y". Retrieved 7 March 2011. ^ "Yandonooka". Sunday Times. Perth, Western Australia: National Library of Australia. 22 May 1927. p. 21. Retrieved 17 September 2013. This page was last edited on 11 June 2017, at 15:11 (UTC).